Looking for the perfect gift for that special occasion? Why not give an Annata Gift Voucher? We can arrange a personalised Annata Gift voucher for your nominated value. 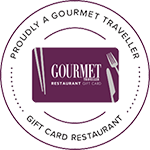 We also accept Gourmet Traveller gift cards. Follow the link below to purchase gift cards from Gourmet Traveller. Maybe you would like to consider a special experience? We can arrange a number of special experiences to suit any occasion. Have you considered any of the following ideas? Explore the world of whisk(e)y with a personalised tasting tour covering the key whisk(e)y producing countries around the world.